The Carlson Mocny family invites you to share in their tales of adventures in parenting, cooking, crafting, living a frugal and fun life, and loving Jesus. Jason reads Bug a story. She was about four months old here. What do I enjoy most about my job? My number one focus on encouraging people to read is for them to share their love of reading with an infant (including those baby bumps! ), toddler or preschool child. Exposing infants and toddlers to stories is the stepping stone to providing them with the ability to read. Every child should hear 1000 stories before they even begin learning to read! Just think: if you read one story a day to your child before they reach age 5 that will be 1,826 stories. Hearing one story a day will put them well on their way to achieving reading success. Are you wondering how will you ever find that many stories? Ask your librarian, teacher friends, or daycare providers for their favorites. Ask your family and friends what their childhood favorites were. Use the social media tool, Pinterest, for reading lists, suggestions and activities or browse Goodreads or Amazon for picture book lists. What should you look for in a picture book? Bright colors, contrasting colors and patterns, repetition, rhyming and interactive books are kinds of stories to share with young children. Some of my favorites are: Elmer by David McKee (patterns), The Napping House by Audrey Wood (repetition), Time for Bed by Denise Fleming (colors), Chicka Chicka Boom Boom by Bill Martin Jr. (rhyming), Clap Your Hands by Lorinda Bryan Cauley (interactive). Many childhood favorites are available in the board book format which is perfect for little hands. 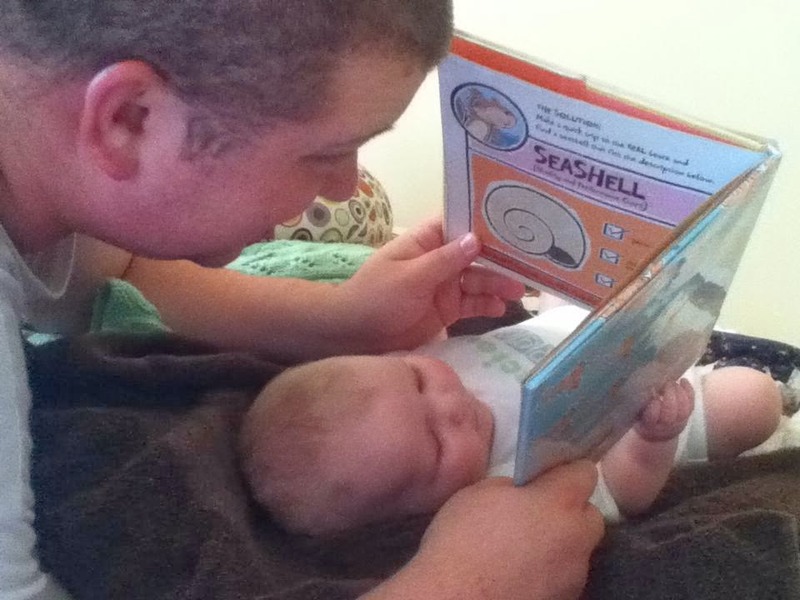 Now you may be wondering, why should you read to a baby, toddler or preschool child? Your voice stimulates an interest in sounds and helps develop listening skills. It also stimulates imagination. Reading develops bonding and when done regularly establishes a routine that will come to be expected and viewed as fun! It builds vocabulary and improves communication skills. Talking to your child spurs speech growth and language development by the use of rhythm and speech patterns. Plan to share some one-on-one time reading with your baby every day. It is the best gift you can give them! Christine Heron lives in Swartz Creek, MI with her husband of 25 years, one daughter and two sons, a pet dog, cat and three goats. She has worked for the Genesee District Library since 1993. . Mrs. Heron is known at the Fenton Library as Miss Chris. She has served on various committees including Michigan Reads! the one state, one children’s book program geared to promoting the value and benefits of reading early and often to preschool children. Miss Chris, also, plans programming for children of all ages in Genesee County to promote libraries and reading. We are a happily married couple with a 3-year-old daughter, nicknamed Bug, a 1-year-old son, nicknamed Dino, and a crazy cat, Preston. You'll find delicious recipes, book reviews, parenting tips and tricks, ways to save money and more here. We love sharing our lives with you and are so excited you are here! Purposeful Parenting: hospital bag must-haves! Free Chocolate & Coupon At JCPenney!